From a brand perspective, social media is the gift of a brand platform, a place to step up to the podium and let your voice ring out. There’s no better place to share content and be heard. When we share a post on social media—particularly Facebook and LinkedIn—a title and summary of content from that hyperlink are pulled in right along with the link. These are called snippets. Snippets also show up in search engine results when a piece of content is listed (although Google occasionally rebels by replacing them with its own inexplicably bizarre findings). Are snippets arbitrary? Nope. We can control the message. Snippets aren’t created by accident. They are pulled from the original piece of content, and that’s where you control what gets pulled. With a tiny bit of basic SEO knowledge, you have the ability to control the copy in your snippets. Why should you care what the snippet says? Because it determines shareability and clicks. Who shares something if the snippet doesn’t appeal to them, or if its missing? Nobody. A compelling snippet also drives readership and, ultimately, impacts conversion. You may already know you can click on a snippet from within Facebook while creating a post, so why control it at the post level? Because it gives you control over the snippet others are sharing—total control over that message, its power to drive clicks and shares, and when a post is shared without editing options (LinkedIn, for example). It’s also a brand message opportunity. If you blog for your personal brand, employer, or agency clients, you need to learn this. You can take control. Let’s talk about how to do it. 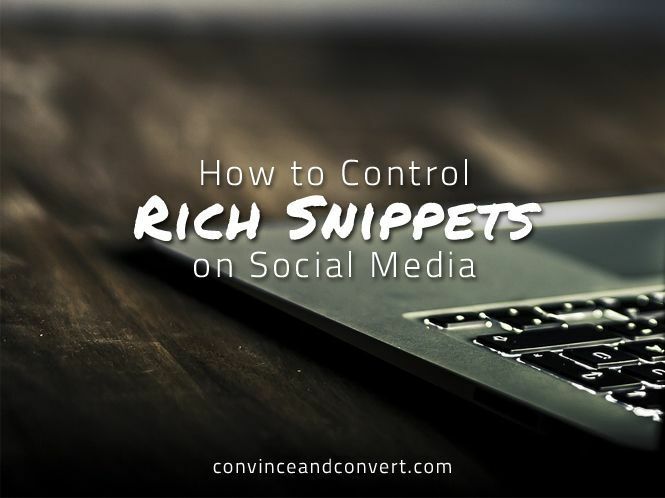 Social media snippets and search engine snippets are created the same way: via the page title and page description, also called meta titles and meta descriptions. In WordPress, you can use a plug-in or the built-in meta fields many themes have (located under the body copy area). Leaving those meta fields blank leaves you vulnerable to whatever the social media platform or search engine chooses to select for the snippet. These meta tags tell the platform or search engine what to use. Not having these meta tags in place will result in arbitrary text being used, which we don’t want. Creating snippets is fairly simple, but not all platforms handle them the same, or even offer the ability to do them. From within a WordPress dashboard, locate your meta fields. I use Yoast, but you can use any SEO plug-in or the fields provided by your theme. Copy your page or post title, then paste it into the page title field. Be sure to look at the preview pane (normally right above the fields) to make sure your title isn’t too long. If it is, edit it down as necessary—don’t leave it too long. It will be cut off and replaced with an ellipsis. This can completely alter the meaning of your title, and the description summary can end up a mess of meaningless fragmented sentences. Next comes the page description. I usually copy the first sentence of my post or a few sentences that are a nice summary of what the post is about, then paste it in the page description field, editing it down as needed to fit the maximum character count. Once these are both in place, they’ll be published right along with your blog post, appearing in the source code for the page. They don’t appear anywhere on the post itself. They’re invisible to the viewer, until they appear in a snippet somewhere online. Here’s an example from my own blog of how the above snippet was created for a Facebook post, showing the meta fields used. If you compare this image to the Facebook snippet above, you’ll see how they match. One feeds the other. Guest blog posts handle snippets based on the platform used. If it’s a site where you upload your own post, such as a syndication site, it’s usually a WordPress platform, handled just like you would your own post. If not, it’s often something you can put in the “comments” or instructions field or via the email in which you first send the post. If it’s a PR publication, and you are submitting a byline article, I don’t ask. Snippets are their business, because you’re not part of the publication or editorial team. You’re a guest. SEO and snippet requests may fall outside of that media relations area and is a bit delicate. If I’m creating a guest post and have noticed on their social media page that they don’t manage their snippets, I’ll send a page title and description over with my post, asking them to use it. If they don’t, they don’t—but if they do, my snippets will look great. I use a character counter tool like this one to make sure my snippets don’t exceed the maximum number of characters allowed. If you are writing content for a blog that is not self-hosted (a free blog platform, for example), you cannot do snippets because the functionality of your blog is extremely limited. If you are writing content for SlideShare, the site automatically creates a transcript of your content. Take care with the title of the content and what you upload, and be sure to completely fill out the “title” and “description” fields when you upload the file. It seems that anything with those labels creates meta fields, although a quick look at the source code of a post doesn’t confirm this. (I’m hoping SlideShare has it on their “to-do” list for the near future.) The premium version might be different, but at this time, the free version doesn’t allow snippets to be created manually through obvious SEO meta fields. Why pass up an opportunity to control how you content gets shared? Make snippet customization a habitual part of your content publishing process.